High performance two-part adhesive for bonding a wide variety of substrates with outstanding levels of reliability and durability. Toughened to provide high peel and shear strength. It works well on a variety of substrates such as metals, ceramics, wood, glass, many composites and plastics, and is an excellent indoor bonding agent for joining, gluing, potting, panel bonding, and structural bonding. • Room cures to over 4000PSI in overlap shear strength. • Unique toughened formula for impact resistance. This adhesive has controlled flow, a 2:1 mix ratio, a 20-30 minute work life, and develops handling strength in 1-2 hours. Packaged in convenient Duo-Pak cartridges designed for use with the 3M EPX Plus II Applicator. Important: Use only the specified 3M™ EPX™ Plus II Applicator system. 1) Apply adhesive to clean, dry substrates, which are free of paint, oxide films, oils, dust, mold release agents and all other surface contaminants. 2) Place duo-pak cartridge in EPX applicator. Remove cap. Dispense and discard a small amount of adhesive to assure even ratio and free flow. Clear orifice if necessary. Use only 2:1 mixing nozzle by: (a) aligning nozzle notch with cartridge recess, and (b) twisting into place. 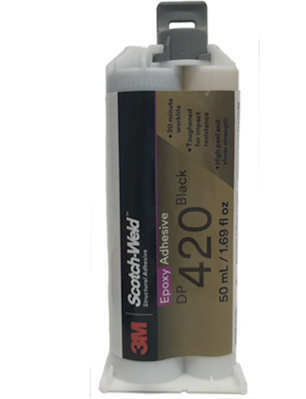 Dispense and discard a small amount of adhesive through nozzle until the adhesive is mixed. - With every purchase of DP420 50ml Adhesive and EPX Plus II Applicator, we will include 1 free 2:1 mixing nozzle.